This is a 29-years old lady who has a 4-months old child. A month after her pregnancy, she started getting some backache and chest pain and was feeling lethargic. She saw her family physician, who attributed all her symptoms and signs to post-pregnancy related issues and put her on standard symptomatic treatment, including vitamin D3 and B12 supplementation. She did not improve and went to another family physician, who did not take her seriously as well and so she changed to a third family physician. This last physician was concerned. She had been having fever and basic tests showed a raised ESR. According to him, she “did not look well”. He ordered a Mantoux and a CT scan of the chest both at the same time. 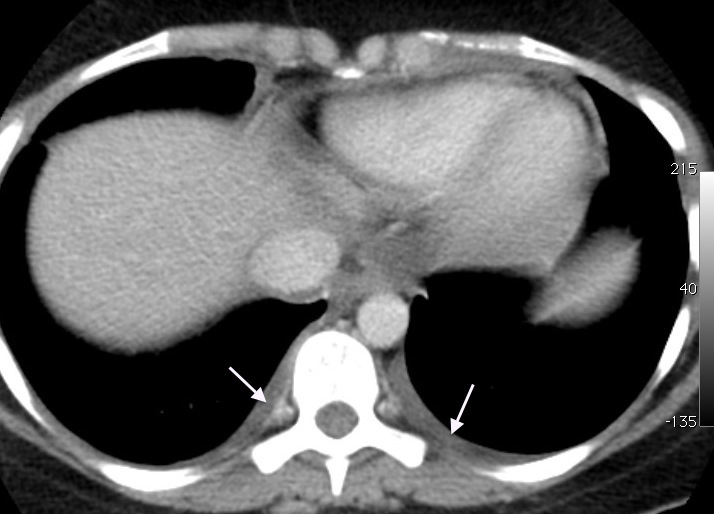 Her CT scan done on Mar 15, 2013, showed enlarged necrotic mediastinal nodes (Fig. 1), pericardial effusion and thickening (Figs. 1,2) and pleural effusions bilaterally (Figs. 2, 3). She was asked to see a chest physician immediately. Her family came to see me and I advised the same. In the mean time her Mantoux came strongly positive. 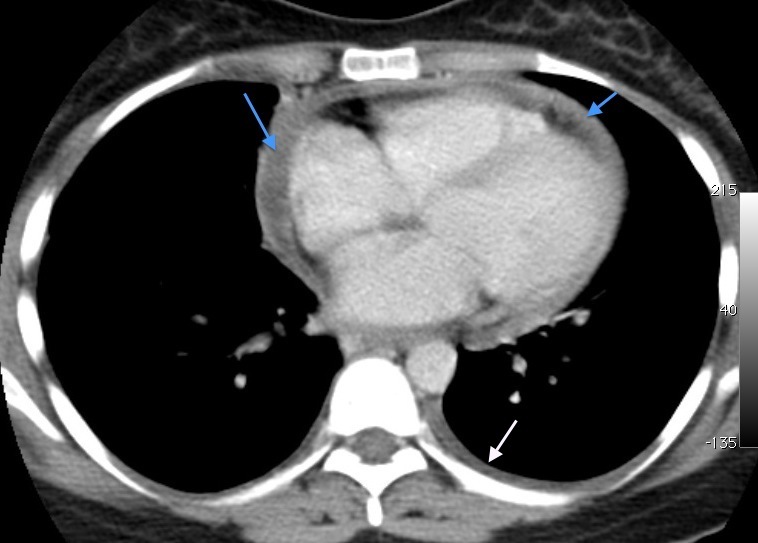 The chest physician started her immediately on first-line anti-tuberculous therapy with steroids for the pericardial effusion. Given the high incidence of primary multi-drug resistant tuberculosis in our country, he cautioned them that in case she did not improve clinically, she would need a CT guided subcarinal node biopsy and she was asked to see me again if that situation were to arise. There was no way to confirm the diagnosis at this time. The pleural fluid was too little and was unlikely to yield any results. The next day, they called me and insisted on getting the biopsy done. Their reasoning was logical – they wanted to confirm the diagnosis and get material for culture and be sure that she was sensitive to first-line drugs. It is rare to find patients and families with such sensibilities. I checked with the chest physician who agreed. If a patient wants a biopsy for confirmation, that is a request to be respected. I posted her for a biopsy on 22 Mar, 2013. After standard counseling and explanations, I positioned her in the prone position to perform an extrapleural, CT guided subcarinal node biopsy. Lo and behold! The preliminary scans showed that the node had mildly regressed in size, the pleural effusions had regressed and the pericardial effusion had partly regressed. I immediately called in the relatives and had the patient turn over and sit up. I explained to them that the partial regression meant response to treatment and that it made no sense to perform the biopsy at this point in time. They too agreed…they were so happy and relieved…these are the times when it is so gratifying to be a physician advising a patient. I repeated another contrast enhanced CT to document these findings (Figs. 4-6). Axial contrast enhanced CT scans of 15 Mar and 22 Mar show partial regression of the subcarinal node. 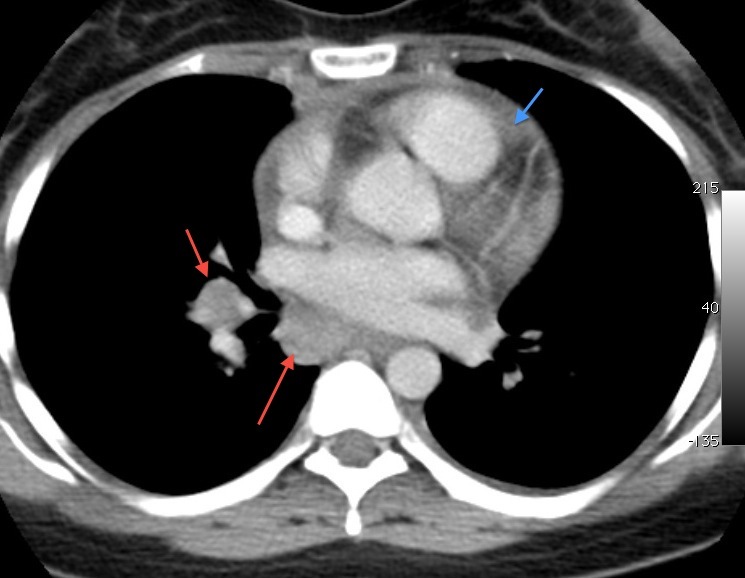 Axial contrast enhanced CT scans of 15 Mar and 22 Mar show partial regression of the pericardial effusion. Axial contrast enhanced CT scans of 15 Mar and 22 Mar show complete regression of the pleural effusions. This is one of the fastest and quickest responses to tuberculosis that I have encountered. A query on Facebook where I had posted this article asked whether there is an increased incidence of tuberculosis in the post-partum period. There is and this Pubmed link has the data. its great satisfying task sir. Really interesting and so gratifying also. yes…..clinical radiologist apart from imaging specialist- shows empathy to patient care and symptoms rather than just investigative ….very interesting ..
Good and sensible advice and gratifying result of the treatment .All of You have done a good job and thanks for sharing your experience BHAVAN. In the era of multi-drug resistant Tuberculosis, this is an amazing response. Breaking such result to patient and physician is very satisfying. The speed of response makes the case very interesting. really great sir! perfect example of clinical as well as radiological understanding. I am not sure I entirely agree about bx being the last resort. Sometimes we waste too much time with investigations when putting a needle would be the fastest way to get an answer. But I agree that we should look at our scans better and have better protocols. Sir last resort should not be counted in days or weeks…. Its within few hours of multimodality approach that can make a difference…….Like yesteday i had a necrotic thick walled lesion in right lobe of the lung on ct ,,with upper liver cuts showing hypodense lesion,,hepatic veins to early to comment,,,a biopsy was already asked for,,and usg showing a definative abscess in liver with sec thrombosis of hepatic vein,, i feel we can wait a bit rather than creating a pneumo….. This is great example of Clinical Radiology and excellent coordination among patient-clinician-radiologist. I think this is the way Radiology should be practiced if we want to keep our speciality alive and respectable. We should not only dictate the cases sitting in the dark room but provide consultation to the treating physician and patient. That is the whole point Jitesh. Was it really TB ? Could it be some other pathology as there is no histopathological or microbiological correlation ? The fast response to TB is also suspicious ? That thought crossed my mind Rajesh. Nothing else really seems to fit. Lymphoma can regress with steroids as well but the pattern and distribution are not typical for that. Connective tissue disease rarely presents with nodes. In any case I am closely following the patient and if she is not TB we will know in some time. U HAVE LED A STRONG EXAMPLE SIR,,, GOD BLESS !! !